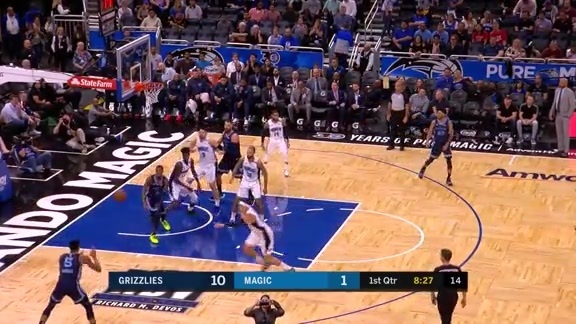 See highlights from Friday’s game against the Magic in Orlando. Tyler Dorsey scored a career high 29 points and dished out 9 assists in the game against the Magic. Watch Jonas Valanciunas put it back for a quick two in OT. 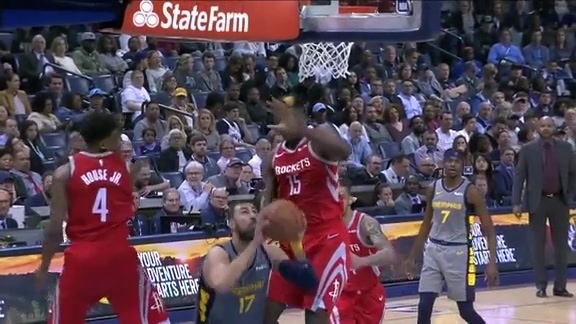 Watch Justin Holiday hit a huge 3 from the corner to extend the lead late in fourth with time ticking away. Watch Ivan Rabb throw it down from a Jevon Carter assist. Watch Tyler Dorsey snag a Valanciunas over-the-shoulder pass off of a Parsons block and run up the lane for a fastbreak layup. Watch Delon Wright blow by his defenders and lay it up and in for points. 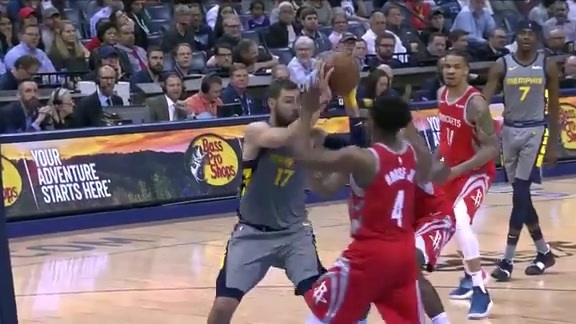 Watch as Chandler Parsons sinks it in and draws contact. 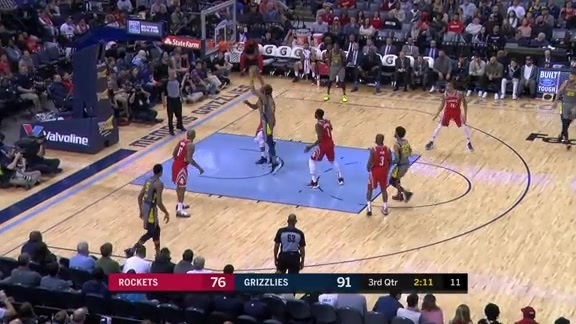 Watch Bruno Caboclo fire it in from the corner for 3. Memphis had little success at the free throw line, shooting just 5-of-12 (.417) in comparison to Orlando connecting on 11-of-13 (.846). The Magic went on a 16-4 run spanning the first 6 minutes of the fourth quarter (12:00-6:02) to narrow their 14 point deficit to 2 (99-97). 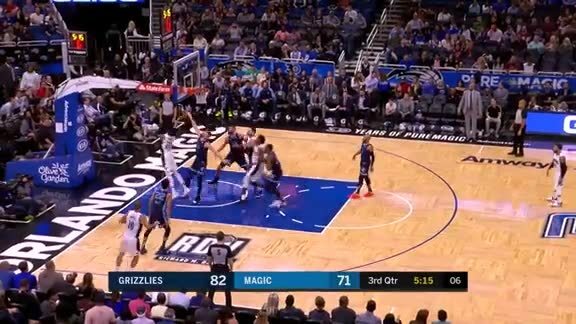 The Memphis Grizzlies led for all of regulation and went to overtime for the second-straight game, but lost to the Orlando Magic, 123-119, on Friday night in the Amway Center. The Grizzlies dropped to 29-43 overall, while the Magic improved to 35-38 on the year. The teams split the season series 1-1, and Memphis is now 3-3 in overtime games this season. Overtime featured plenty of drama, as the extra period had seven lead changes alone. With 35 seconds left, D.J. 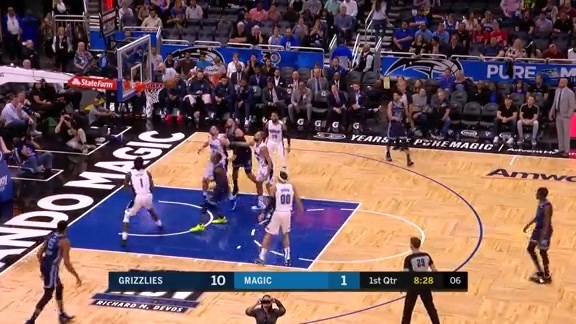 Augustin found a cutting Nikola Vucevic for a layup to give the Magic a 121-118 lead. Tyler Dorsey drew a three-point shooting foul on the next possession with 24.3 seconds remaining, but only managed to make one free throw. The Grizzlies were forced to foul Evan Fournier, who made both free throws to improve the lead to 123-119 with 21 ticks left. Justin Holiday got a couple three-point looks on the last possession, but couldn’t make anything as time expired. 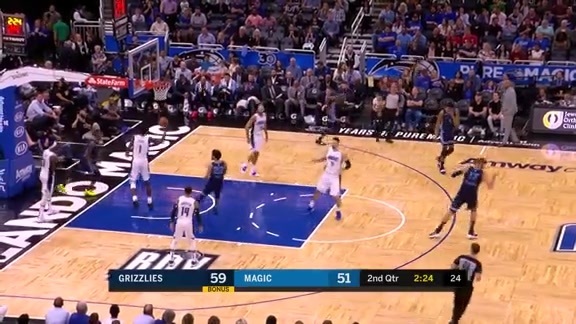 The Magic outscored the Grizzlies 8-4 in the paint during the extra period, and made all three free throws, to secure the win. In his first start of the season, and sixth of his career, Dorsey set career-highs in points (29), assists (nine), field goals (11) and three-pointers (five). Dorsey’s previous personal scoring high came as a member of the Atlanta Hawks, where he scored 22 on April 6, 2018. Jonas Valanciunas logged his 12th double-double of the season, finishing with 23 points and a career-high with 24 rebounds. Valanciunas set the franchise record for defensive rebounds in a game (23), surpassing Shareef Abdur-Raheem, who had 18 defensive boards twice. Valanciunas also recorded the first 20-point, 20-rebound performance for Memphis since Zach Randolph had 21 points and 21 boards against the Spurs on Dec. 17, 2014. Valanciunas also now has seven double-doubles in 14 games with the Grizzlies. Holiday turned in his second-best scoring performance of the season, finishing with 22 points (4-9 3P) while playing a game-high 42:36. Holiday scored in double figures for the first time since Feb. 27, when he had 13 against Chicago. Chandler Parsons added a season-high 17 points off the bench. Parsons has scored in double-digits in three-straight games, averaging 14.6 points during that span. Delon Wright finished with 12 points, eight assists and seven rebounds. All five Grizzlies players that arrived at the trade deadline (Dorsey, Valanciunas, Wright, C.J. Miles and Avery Bradley) have now set single-season scoring highs since coming to Memphis. Additionally, Bradley, Dorsey and Valanciunas have established career-highs as Grizzlies. Memphis struggled at the line, setting a season low for free throw percentage by going 10-for-21 (.476) from the free throw line during the game, while Orlando made 21-of-27 (.778) free throws. Memphis outshot Orlando overall in the game, finishing 47-for-93 (.505) from the field while the Magic were 44-for-93 (.473). 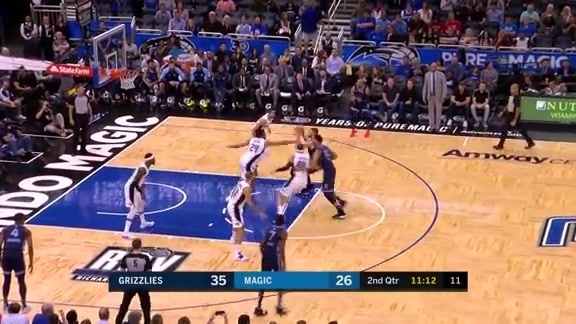 The Grizzlies dished out 28 assists in the game against a Magic defense that was second in the NBA in assists allowed entering tonight (22.9 apg), while Orlando had 30 assists against a Memphis squad that was tied for third (23.0 apg) prior to the game. The Magic won the turnover battle 13-9, leading to a 16-6 advantage in points off of turnovers. Terrence Ross came off the bench to lead all scorers with 31 points while making a season-high eight three-pointers. Ross’ 31 points were his second-most this season. Evan Fournier finished with 27 points, eight boards and six assists. Fournier has scored at least 20 points in back-to-back games. Vucevic added 25 points, scoring 18 of them in the second half and overtime. Augustin also reached 20 points while dishing out a team-high eight assists. Jonathan Isaac rounded out the scoring with 11 points and six rebounds. The Magic worked their way back into the game in the fourth quarter, with Ross once again shouldering the load by scoring 12 of their first 16 points in the quarter. 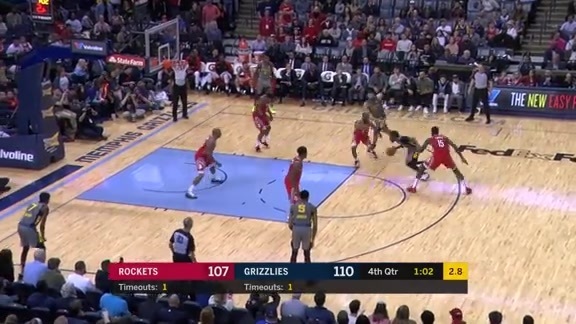 After Grizzlies led by as much as 11 in the fourth, Ross would sink three-pointers on back-to-back possessions to cut the Memphis lead to 99-97 with 6:02 left in the game. Holiday’s third three of the night was his most crucial, coming at the 1:21 mark to push the Memphis lead to 110-106, making it a two-possession game. After the Grizzlies called a timeout with a 110-108 lead, Parsons missed a layup attempt, giving the Magic a chance to tie or lead. Fournier scored a layup on a set play after a timeout, knotting the score up at 110-110. 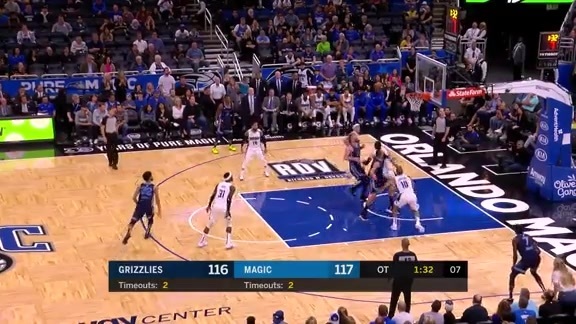 With 17.7 seconds remaining in regulation, Dorsey would dribble the clock down on the ensuing possession, but missed his jumper at the elbow, giving the Magic a chance to win with 1.6 ticks left. 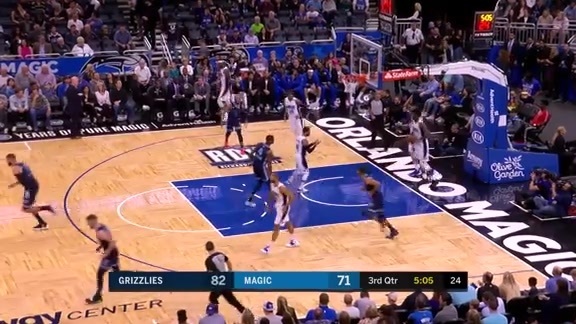 Fournier missed on a decent look from 27 feet out, sending the game to overtime. Memphis turned the ball over five times and shot just 27.8 percent from the floor in the fourth quarter. The Grizzlies knocked down open looks in the first half, going 25-for-44 (.568) from the floor and 9-for-18 (.500) from three. The Magic weren’t far behind though, making 20-of-41 (.488) shots and 7-of-15 (.467) triples in the half. Orlando had far more success at the line, connecting on 11-of-13 (.846) free throws compared to just 5-of-12 (.417) from Memphis. 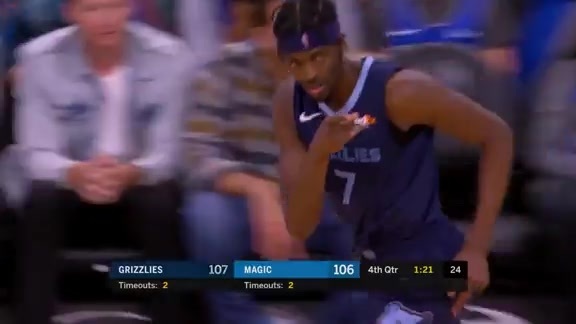 The Grizzlies gained a 5-1 advantage on the offensive glass, which helped them outscore the Magic 7-0 in second chance points in the half. The Grizzlies were dialed in from long distance to begin the game, shooting 6-for-11 (.545) from three-point range in the first quarter. Memphis opened the game with a 13-1 run, with Dorsey, Valanciunas and Bruno Caboclo all swishing threes. Dorsey in particular had the hot hand, scoring 12 points (3-4 3P) in the quarter, already surpassing his previous season high (11). Ross flipped the script for Orlando in the second quarter, scoring 11 of their first 15 points and dropping 14 points total in the quarter. Holiday nearly matched him though, scoring 13 points of his own in the period. Both teams made over 59 percent of their shots in the quarter as the Grizzlies carried a 64-58 lead into intermission. The Grizzlies will host the Minnesota Timberwolves for the last time this season tomorrow on Saturday, March 23 at 7 p.m. CT in FedExForum. It will also be the final Grind City Wrestling Night of the year, where the first 5,000 fans will receive a Grizzlies World Championship Belt. Come out to the game, tune in to FOX Sports Southeast presented by Pinnacle Financial Partners or listen on 92.9 FM ESPN to follow the action. It was a heck of a game. Both teams, I thought, competed and got after it. Just a few small plays here and there that we missed and they were able to finish. It was a heck of a duel going down the stretch. Guys were making plays, making shots. They just made one more play than we did. Yes, he’s got the ability to put the ball in the basket. He’s been playing with our G-League team quite a bit, and we saw him doing that. We told him to go out tonight and be aggressive. He was aggressive and made a lot of shots for us. I thought we still got good looks. Give them credit, they got their defense up. They were more active using their hands and getting deflections, more aggressive in their pick and roll coverages. But, I thought we did a good job of sharing the ball and getting looks that I wanted. Yes. We knew going in with the injuries and being shorthanded, we wanted to protect people as much as we possibly could. Try to stay out of foul trouble. And when we ran it early, it caused them some problems and they started to get hot. Terrence Ross did a really good job of finding the holes. He made us pay. We had to go back to man-to-man to get matched up a little bit more. Just coming off of ball screens and pin downs and things like that and taking advantage of…they gave me a little space and when I hit two in a row the rim was looking big and I constantly kept going at it during the game like that, and unfortunately we came up short. A couple big, big plays I missed and at the end with the free throws so I am not happy about it but I like the effort we gave. We just didn’t have a lot of bodies so fatigue kicked in and we just weren’t getting the stops and they got hot from three. It is a game of runs so we knew they gonna make a run so we just had to stand…we didn’t finish it tonight. It came down to free throws and defensive stops, but it was a good game. It gives us confidence going into the next game. We have a back-to-back so we have to be ready, bring that same energy, that same mentality we came in with tonight at the beginning. We are missing a lot of vets…a lot of people were sore, hurt, so we will have them the next game so we will have our full team and be ready for the back-to-back. He is a beast down low. When you give it to him down low he is gonna get a bucket. He is taking care of the glass, eating up the glass, getting every rebound, and setting up good screens. That is how I was getting a lot of good looks. He set amazing screens tonight for me and everybody else so he had an amazing game unfortunately we couldn’t get the win. Tyler Dorsey set career-highs in points (29), assists (nine), field goals (11) and three-pointers (five) in his first career start for the Grizzlies. Jonas Valanciunas logged his 12th double-double of the season and set the franchise record for defensive rebounds in a game (23). He also recorded the first 20-point, 20-rebound performance for Memphis since Zach Randolph in 2014. Justin Holiday had his second-best scoring performance of the season, finishing with 22 points (4-9 3P) while playing a game-high 42:36. Chandler Parsons added a season-high 17 points off the bench. Parsons has scored in double-digits in three-straight games, averaging 14.6 points during that span. Delon Wright finished with 12 points, eight assists and seven rebounds. Terrence Ross came off the bench to lead all scorers with 31 points while making a season-high eight three-pointers. Evan Fournier finished with 27 points, eight boards and six assists. 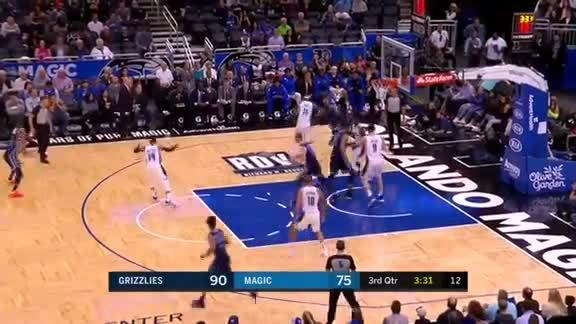 ​​​​​​Nikola Vucevic added 25 points, scoring 18 of them in the second half and overtime.